As I’ve mentioned before, the way that I achieved my 100-pound weight loss was to make one small change at a time. The first thing I did was to simply start drinking enough water. And, even though I started out on Weight Watchers and following the points system, there were times (still are, actually) when I felt like I wanted to eat a second helping of something awesome–and if I had the points in my daily budget, it didn’t seem like a big deal. 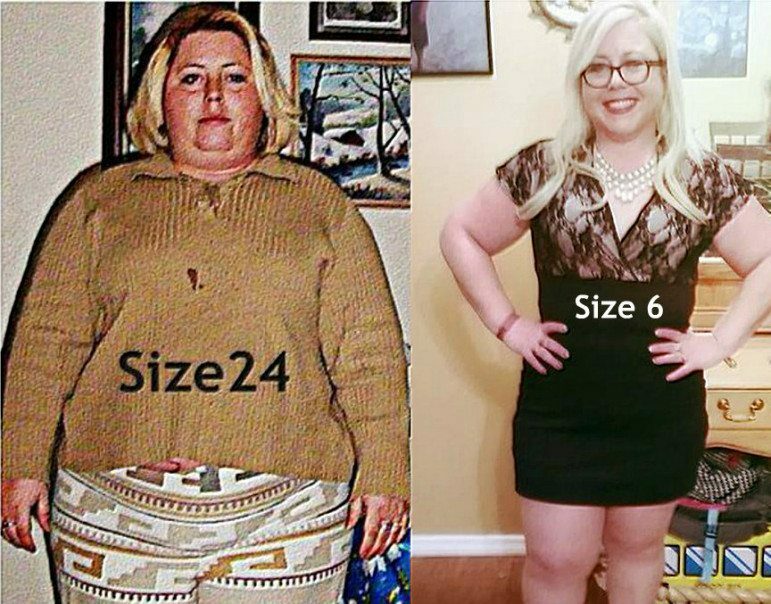 Want to learn how I lost 100 pounds? See my story, right here. So in the process of losing weight, I was always looking for ways to refine my process and make it go more smoothly and BLISSFULLY (which is why the book is called Project Blissful!). That’s what led me to do the research on the whole eating seconds thing – and since I’m no scientist, I’ll just let the ones from Harvard Medical School tell you the science behind it. Anyhoo, since it takes your brain approximately 20 minutes to inform your body that you’ve had enough, I would sometimes end up eating more than I wanted. So, I made a new rule, and it hasn’t failed me yet. I allow myself to eat literally WHATEVER I WANT, but I only take one serving at a time AND I wait 20 minutes between servings. I also try to eat slowly, for the same reason. (According to Harvard researchers, there’s a good reason for doing so.) For me, that usually means I don’t eat a second serving, because I really do feel satiated by the single serving in most cases. Starting today, make the same rule for yourself. 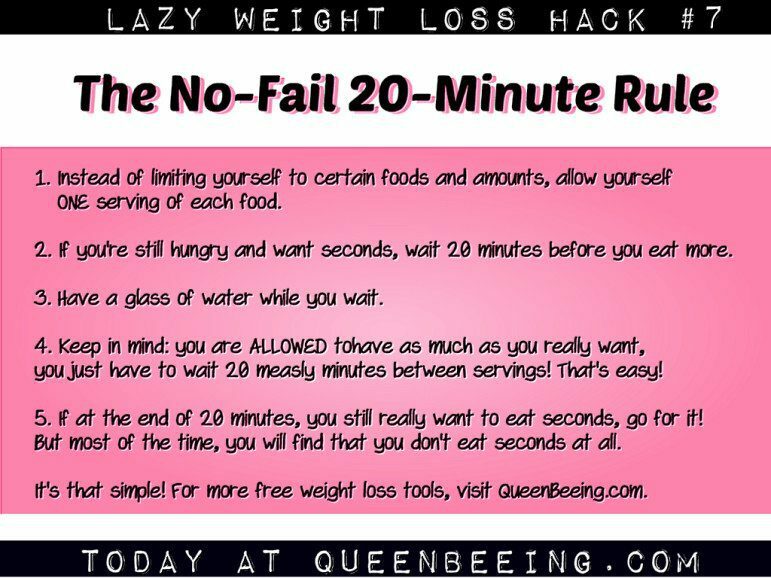 If you still feel hungry after eating a single serving or plate of food, give yourself a 20-minute break before loading up that plate again or taking a second helping. It’s so simple, but this single change can offer you a serious advantage on your weight-loss journey. Will you give it a shot? 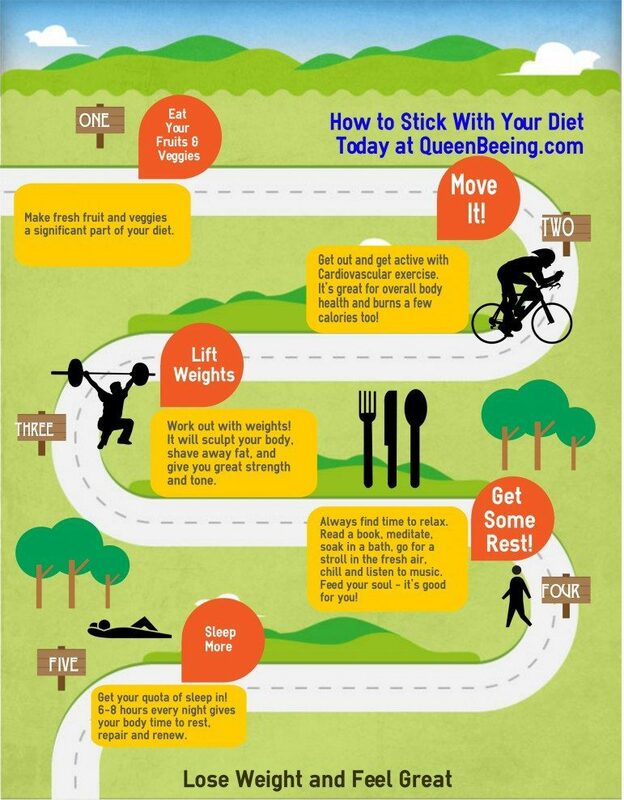 What are your best weight-loss tips? Share your thoughts and experiences in the comments section below! So you want to lose weight, but you don’t want to be miserable in the process. I feel you! And I’ve got good news for you. It can be done, but it’s not necessarily going to be a cakewalk (pun totally intended). Here’s how you do it: you re-program your brain. You “re-wire” it so that it believes that it PREFERS the food you NEED to eat to lose weight. This means that you need to teach your body to WANT the foods you need to eat to get the healthy body you really desire. But sometimes, that’s easier said than done, am I right? Well, why is that? Let’s take a look at some recent statistics that might give us an idea. A recent study found that less than 10% of Americans are eating enough vegetables. According to the Centers for Disease Control and Prevention, less than 14% of Americans are consuming the recommended 2 to 4 daily servings of fruit. The CDC also notes that less than than 9% consume 3 to 5 servings of vegetables. So how do you overcome those kinds of statistics? Now, don’t fall over when I say this, because it’s the truth, and if you are willing to make it happen, you CAN, despite how impossible it seems. Here it is: If you’re going to beat the odds, you may need to rewire your brain so you crave broccoli more than bacon. Each time you choose healthier foods, you’re strengthening your desire for them. I’m not going to lie to you. There are so many healthy foods I really love – but it’s not because they’re healthy (though, to be honest, that doesn’t hurt my opinion). The reason I love healthy food at all is the same reason I love unhealthy food – because it tastes good. In the course of losing 100 pounds and keeping it of for the last nearly 4 years (so far), I learned to sort of “trick” my body into actually preferring healthy good. So how’d I do that? Well, I’m glad you asked. Take a look at these suggestions for changing the way you think and eat and let me know what you think in the comments. 1. Remember your purpose. 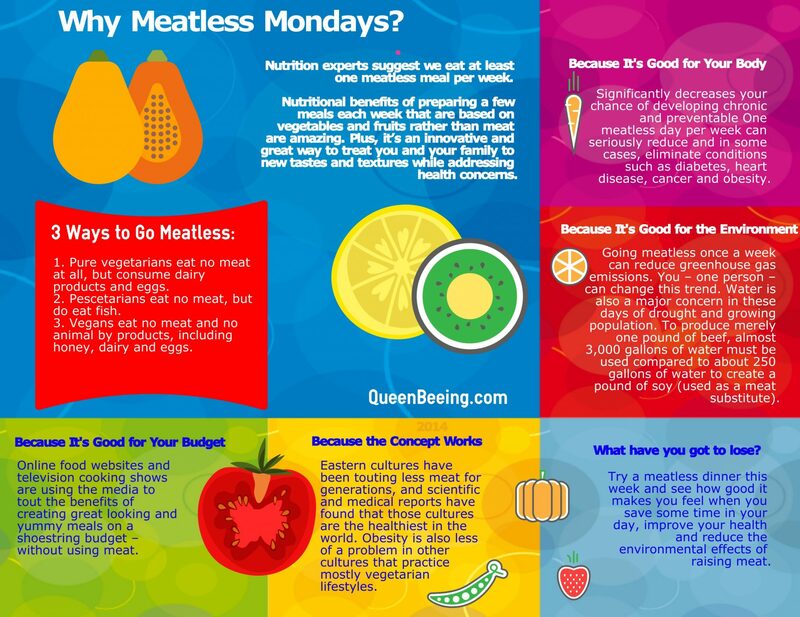 Focus on why you want to eat nutritious whole foods. Cutting down on empty calories can help you look and feel your best. You’ll have more energy, and you may even save on medical bills. 2. Plan ahead. Ask yourself if a few minutes of munching on corn chips is worth the consequences. Would your future self be better off if you snacked on baby carrots? 3. Study nutrition. The more you know about how your diet affects your health, the stronger your motivation will be. Schedule a session with a registered dietician or browse online to learn more about reading food labels and restaurant menus. 4. Form new habits. It’s easier to start a positive new habit than to break an old routine. If you’re used to eating a donut with your coffee, treat yourself to a few almonds instead of going hungry. 5. Focus on nonedible rewards. If emotional eating is a concern, you may need to seek gratification elsewhere. Reward yourself by watching a movie or spending time with friends. 6. Enlist support. Speaking of friends, social support is vital. Surround yourself with others who are trying to eat well so you can share encouragement and feedback. 1. Add healthy fats. You may have noticed a recent shift in nutritional advice. Experts are now talking less about avoiding fats, and more about choosing healthy fats. Broccoli can be a lot more appealing when you drizzle on olive oil. Personally, I cannot say enough good things about coconut oil. 2. Hunt for bargains. Maybe the high price of some superfoods is dampening your enthusiasm. Shop for seasonal produce or grow your own. Stock up on inexpensive staples like beans and lentils. Visit the bulk bins where you can save on packaging costs, and sample small quantities until you discover your favorite grains and seeds. 3. Beautify your place settings. Presentation makes a big difference. Sit down to eat. Create an attractive centerpiece or light candles. Use colorful dishes and bowls. 4. Branch out. If kale and iceberg are starting to bore you, experiment with other salad greens like oakleaf or mizuna. 5. Try new recipes. Get busy and Google it – or sign up for cooking classes or visit the library for more ideas about what to make for dinner. A lot of grocery stores offer cooking classes. 6. Carry your own snacks. Bring hummus or yogurt to the office with you for your afternoon break. You’ll soon like your own fresh food better than the packaged goods in the vending machines. 6. Make it convenient. The foods we crave are often the ones that require minimal effort like cookies and frozen dinners. You can make healthy substitutes just as handy. Keep a bowl of fruit on your dining room table. Buy whole-wheat pizza crusts you can top with cut vegetables and cheese for a hot meal in minutes. Imagine looking forward to a bowl of beets with the same enthusiasm you usually reserve for double-fudge brownies. Some simple mental training, along with adjusting a few lifestyle habits, will have you craving food that’s good for you. You feel me? Need more help losing weight? 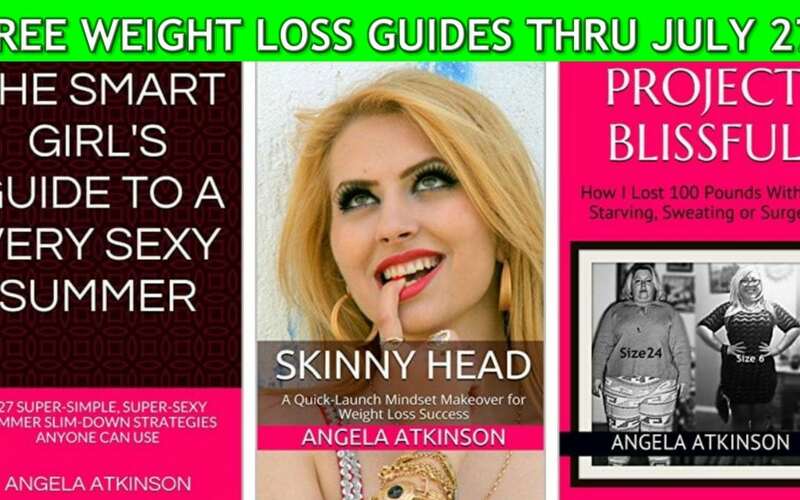 Check out my book, Project Blissful – it’s the story of how I lost more than 100 pounds and have kept it off. See the ebook here and the paperback here, or visit BooksAngieWrote.com for a selection of all of my books. Exercise offers an ideal way to get yourself fit and can benefit you in a number of ways. Not only can it improve your health and fitness levels, but it can also help you to feel better about yourself and enhance your mood. If you don’t know where to begin with a new exercise regime, here are some tips to get you started. 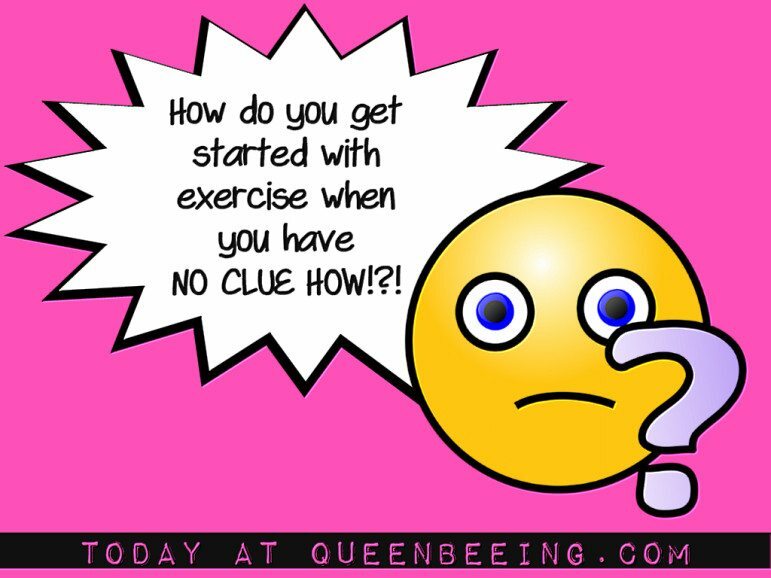 If you’ve never exercised before or you’re a bit out of practice, you should start with something easy and not too strenuous. It’s important that you enjoy what you’re doing as well; otherwise you won’t stick to it. Swimming is an easy exercise to begin with, as it needs very little investment and it’s gentle on your muscles. If you like to run, then this is another type of exercise that is quick to get started with. For those who need a bit of motivation to keep going, group exercise could be beneficial for you. You can do a search in your local area to find a range of different classes, including zumba, boot camps, running clubs, kettle bells and yoga. It’s vital that you don’t go all out in the very beginning and become too eager to reach your targets. By doing this, you run the risk of injuring yourself. You should start slowly and only do a little bit at a time until your body gets used to it. Then you can gradually increase the time, intensity and frequency as your body adapts. Don’t be over ambitious with your targets, as this will just put you off when you don’t reach them. Look at what you can do now and focus on improving one step at a time. If you’re new to exercise or have any pre-existing medical conditions, then it’s a good idea to talk to your doctor before you start. They can check out your current fitness levels and suggest the most appropriate types of exercise. They’ll also be able to keep an eye on any current injuries and show you ways of exercising that won’t strain them any further. While you’re building up your fitness levels or after an injury, wearing a type of compression sleeve such as a knee support could be beneficial. These help to reduce joint and muscle pain and improve blood circulation. It’s all too easy to get bored with an exercise routine, especially if you’re always doing the same thing. Try and mix your regime up a bit and do a variety of different exercises. Choose a time that works for you so that exercising becomes a habit that you look forward to. Build in rewards to keep you going. These could include buying a new outfit if you complete a whole month or having a special day out if you reach a certain target. Exercise should become a habit and a way of life that improves your general fitness and well-being. By starting off in the right vein, you’re more likely to be successful and stick with what you’re doing.